A preview of Everton's meeting with Arsenal at Goodison Park. Everton welcome Arsenal to Goodison Park on Sunday afternoon, looking to extend their winning run to three games. Marco Silva’s Blues have a resurgence in recent weeks, beating Chelsea in their last home game before a dominating win over West Ham United last time out. It’s a turnaround for Silva’s side who had seemingly lost their way only a few weeks ago. However, they don’t face an easy test on Sunday afternoon. Unai Emery’s side are unbeaten in their last six premier league games, beating Newcastle United 2-0 last time out. They’ve scored nine goals in their last five games, having not kept out since February, and currently sit fourth in the League table. The Gunners will be desperate to make a return to the Champions League next season but face a tough run-in due to a tightly contested chasing pack in the top-four. Both Chelsea and Manchester United, for all their respective shortcomings this term, sit in position to capitalise on any sort of slip up from Emery’s side. The two sides last met in September, when goals from Alexander Lacazette and Pierre-Emerick Aubameyang gave the Gunners a 2-0 win. Silva’s side had their chances early on the Emirates but fell behind just after half-time following a stunning finish from Lacazette. 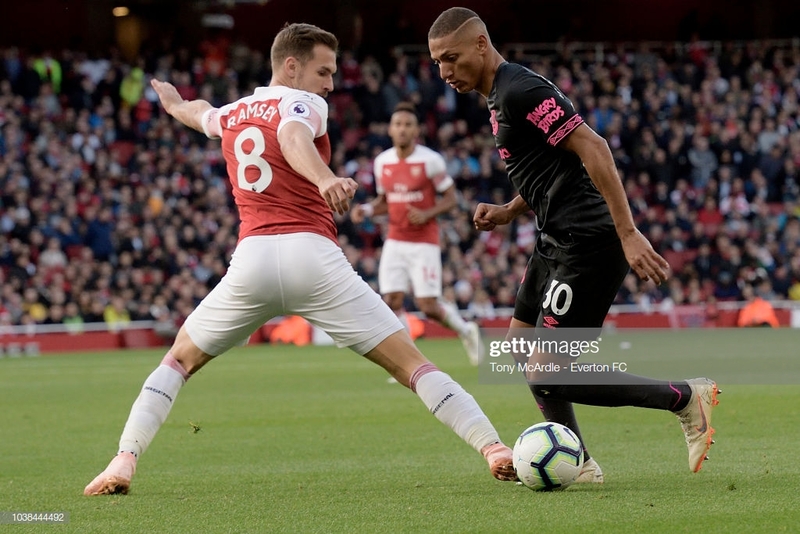 Emery’s side doubled their lead last than three minutes later, with Aubameyang scoring a fortuitous goal just before the hour-mark. Initial replays showed that the forward had been in an offside position before hammering home but the goal stood and the Blues were left to rue their early dominance. Everton shot-stopper Jordan Pickford was involved in a fracas in his hometown of Sunderland following the Blues’ win over West Ham. Despite the incident being investigated by the club, the Everton boss believes his ‘keeper is in the right frame of mind to play. “For us as a manager and us as a club I am not happy (with the incident),” said Silva. “The player is not happy with what happened. As football players, they have an obligation. It is clear to them. It is a matter for us to remind him. “He has had full focus during the week to prepare for the next match,” added the Blues boss. Arsenal boss Unai Emery says that he and his side are looking forward to facing a tough Everton side, who will present a ‘big challenge’ to the Gunners in their bid to wrap up Champions League qualification. "For us, it's a big challenge. We want to achieve the same good performances as when we play at Emirates Stadium,” said the Gunners boss in his pre-match press conference. He added: "We have confidence now but we know it's very difficult and I think it's a long way until the last matches. "Each match is worth three points, like Sunday against Everton, which is the most important. We know other clubs will take a lot of points." Everton have a relatively fresh bill of health, with only Yerry Mina sidelined through injury. Silva is unlikely to tinker with the team that comfortably saw off West Ham last time out - meaning that Dominic Calvert-Lewin should lead the line, flanked by the Brazilian duo of Bernard and Richarlison. As for Arsenal, Unai Emery has a number of concerns. Influential midfielder Lucas Torreira is suspended, while Laurent Koscielny and Granit Xhaka are both injury doubts. Yet, there is a bit of good news. Aaron Ramsey, who will leave the club for Juventus in the summer, is fit again following a groin problem that plagued him in the win over Newcastle on Monday night. Everton have lost their last four meetings with the Gunners. Arsenal’s last visit to Goodison Park ended up with the visitors hammering the Blues 5-2. Then-Everton boss Ronald Koeman was sacked following the result.